SAT, JAN 26 2019, 11am-8pm. Yoga | Pilates | Balance Barre | Spinning ® | Holistic Health | Bootcamp | Boxfit | Nutrition | Meditation. 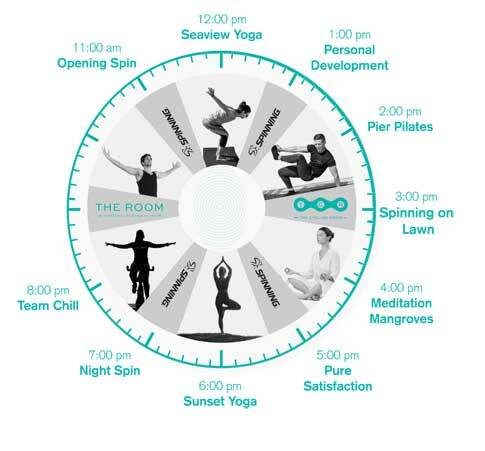 Enjoy sessions with Spinning® presenters, yoga teachers, pilates instructors and our holistic health seminars. Choose a 1-hour Spinning® ride, stretch off with a pilates sessions and relax at the pool or take part in a holistic health or personal development workshop. The choice is yours. Prices start from AED 299. Include a delicious Yas Links buffet for just AED 150 per person. * For ticket purchases of 7 people or more, please contact us by phone or email.